Louis Vuitton's newest store, the biggest in North America, opened today (Dec 3 2009) in Las Vegas, at the Crystals in CityCenter. I'm delighted to say I designed all the electronics that run the LEDs! Continuous monitoring of power supplies, temperature, DMX signal, etc. I'm happy to say my hardware design achieves all this. 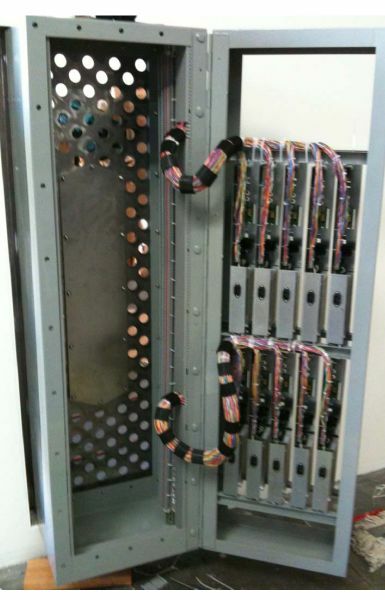 The installation comprises of 80 separate 60-channel LED driver boards, each with its own power supply, mounted on an aluminum "shelf" and installed 10 per cabinet, 8 cabinets total. The driver boards watch for power supply problems and over temperature and LED failures continually while they run, and each cabinet has one Ethernet-enabled monitor board that queries each of the 10 driver boards and reports all information via a generated webpage. So a technician can look at one webpage to see the status of everything in a cabinet at a glance. 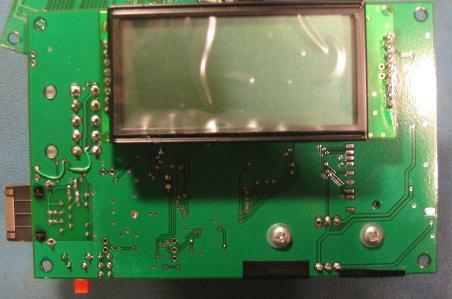 Additionally, each driver board and the monitor board has a LCD display showing status, updated continually. The LEDs are plugged into the back connectors, 12 per connector, 5 connectors total, for 60 LEDs total. 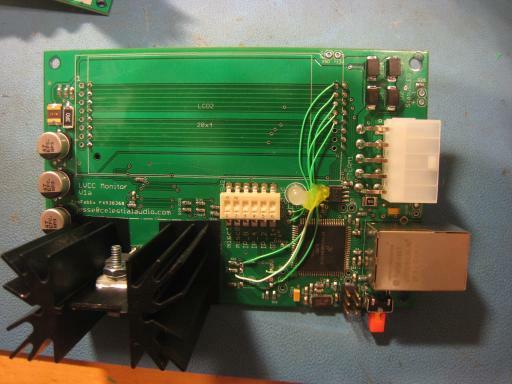 This allows the board to be removed from the LEDs it drives reasonably easily. Each connector has a 5amp fast-blow fuse for UL safety requirements. 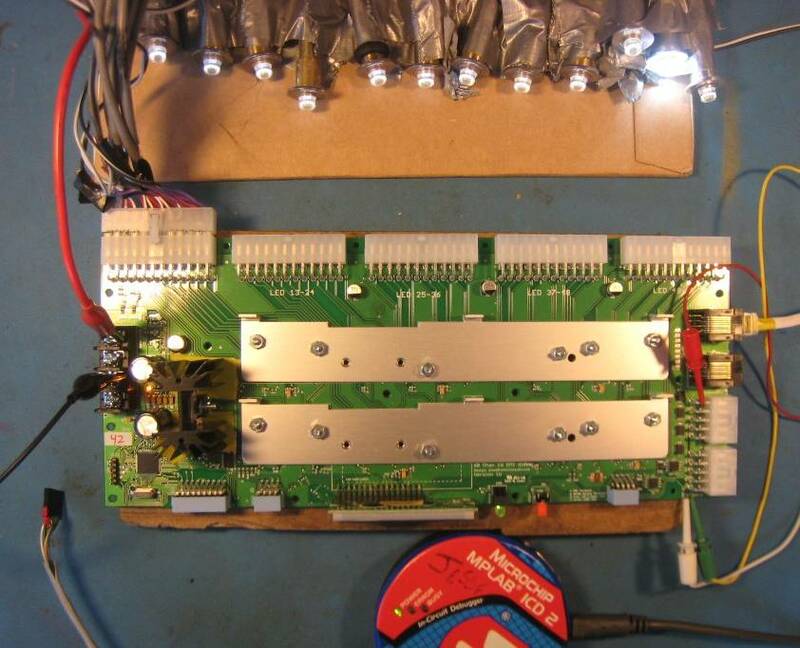 The two metal slats on the board are heatsinks, under them are 15 driver chips. On the left is +5V power (two connects for +5V and two for ground, since it is 20amps peak) and on the right is DMX input (on cat5 ethernet) and another connector for +12V board electronics power and RS-485 based monitoring. 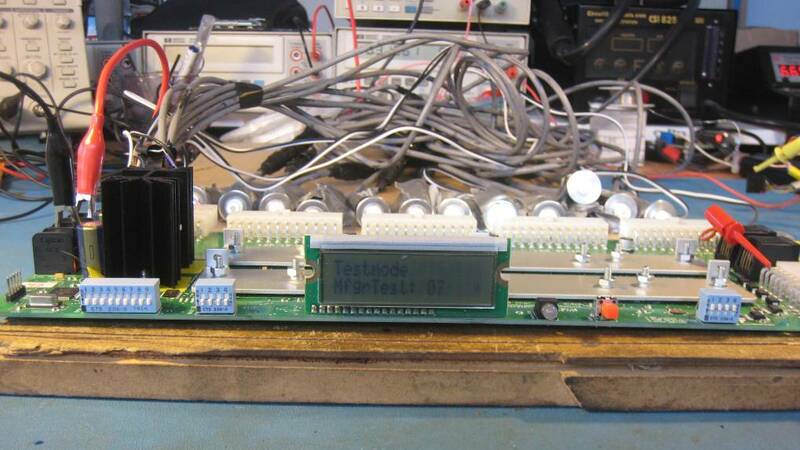 This shows the little LCD status display, DIPswitches to select DMX ID and UnitID (i.e. which# of the 10 this board is in its cabinet), several test modes and termination on/off, a bicolor DMX signal status LED, and an orange reset button. Here's two photos of them in a cabinet, being assembled, the left picture is the front view and the right picture the "back". They are mounted vertically on a "door" that can be opened to get to those 5 big connectors for removal if necessary. There are 8 of these cabinets. I wasn't involved in any of the actual assembly and installation, fortunately, just consulting by phone as needed. There is a lot of wire out there. As with most projects, this one is a combination of reworked existing, proven designs and new stuff. And as with most projects it wasn't without some stress-inducing gotchas, both due to mistakes I made and showstoppers I had no control over: bugs in the C compiler (CCS for PIC18F series) and in the driver chips themselves (TI TLC5940). However, I try to do designs with a "plan B" in ways large and small when possible/practical, and I hate to fail, so after some effort all issues were resolved or worked around satisfactorily, and now LV Las Vegas is the newest neato lightshow on the Strip! A hearty "thank you" to Meritronics for the manufacturing of 90 of these driver boards on pretty short notice and working around some minor board layout snafus. These are a lot less exciting looking than the driver boards but are vital for the long-term health of the installation. These are installed in each cabinet, and wired to each of the 10 driver boards in it, and continually display a summary of driver boards' status on the LCD (photo doesn't show text, sorry), have a red/green status LED (showing "good/problem" at a glance) and most importantly via a webpage the board creates on demand with up-to-the-second status of everything. This uses the Freescale MC9S12NE64 16-bit microcontroller with built-in Etherenet MAC & PHY, so with appropriate firmware it is a one-chip custom webserver. I took this project, designed a new board, cut a bunch of code, added some new stuff, fixed a few minor mistakes and voila - remote monitoring (and click a link to reboot!) of all of the boards that run all the LEDs. I design stuff like this all the time, if you have a project you need custom work for, drop me a line. Also see DMX LED drivers for sale.